KATHMANDU, June 29: The government has set a target of producing 5.4 million tons of paddy this season. Speaking at an interaction in Kathmandu on Wednesday, Deputy Spokesperson for the Ministry of Agriculture, Shankhar Sapkota, said that the government has brought different programs to become self-sufficient in paddy within three years. The interaction was organized by Nepal Agriculture Journalists Academy on the eve of 14th National Paddy Day. Sapkota also said that the government has implemented different programs in key districts to increase production of paddy. “We had launched different programs in 20 districts in Fiscal Year 2014/15. Similarly, we introduced different programs for 15 Tarai districts in Fiscal Year 2015/16. 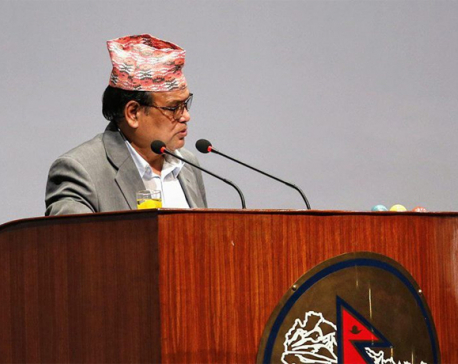 We will hand over these programs to local units from the new fiscal year,” Sapkota said, adding that the government has also started Prime Minister Agricultural Modernization Project. One of the targets of the project, according to Sapkota, is to become self-sufficient in paddy. Under the project, the paddy production area has been classified into blocks, zones and super zones. Likewise, the government is also planning to increase off-season paddy production in 50 districts to 300,000 hectares from existing 118,000 hectares. According to the Ministry of Agricultural Development, the country produced a record 5.2 million tons of paddy in the current fiscal year. Despite record high production, the country imported 359,000 tons of rice worth Rs 20 billion from countries like India, Italy, China, Thailand, South Korea and Japan in the first 10 months of the current fiscal year, data of Trade and Export Promotion Centre (TEPC) shows. In Fiscal Year 2015/16, Nepal had imported 539,000 metric tons of rice worth Rs 22.80 billion. Paddy plantation was done in 1.5 million hectares land across the country in the current fiscal year. Paddy plantation is done in 50 percent of cultivable land in the country. Nearly 70 percent of paddy is produced in Tarai districts, and remaining 30 percent in hilly districts, according to the ministry. Tilak Chaulagain, a senior planning officer with Prime Minister Agricultural Modernization Project, says that the government has put self-sufficiency in paddy production in high priority. “The 10-year project is estimated to cost Rs 130 billion,” he added. Also speaking at the program, Bhaba Tripathi, chief of International Rice Research Institute (IRRI), said the institute was developing different paddy varieties that can cope with extreme heat and submergence. “There already are different varieties of paddy that give high yields. But farmers are yet to get hold of these varieties,” he added. Agriculture sector contribute around 29 percent to gross domestic production (GDP).